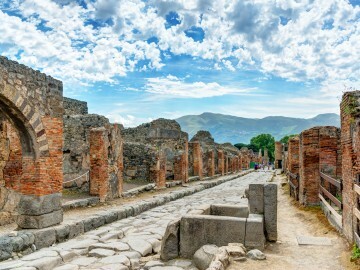 Pompeii is the most famous and evocative archeological UNESCO site in the world, the walk amongst its ruins will be an amazing and unique experience. 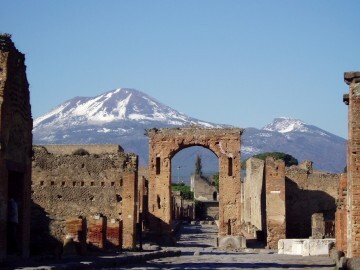 Back in the 79 AD the town was buried under a 6-7 meter thick layer of ash and cinder of the eruption of the Mt Vesuvius. 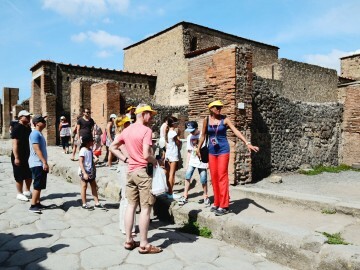 The tour starts every day from Naples, in Pompeii the walking tour with the archaeological guide* or with audioguides lasts around 1.5 hours.Throughout this visit you will admire the famoust section.It will be a pleasant journey into the past! 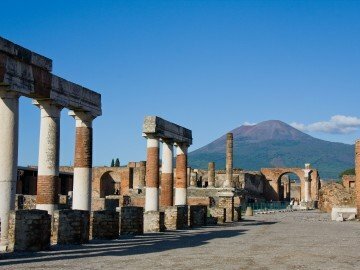 With this tour you can visit in just one day the world famous Pompeii excavations and the volcano called Mt Vesuvius that destroyed and burried the city almost 2000 years ago. 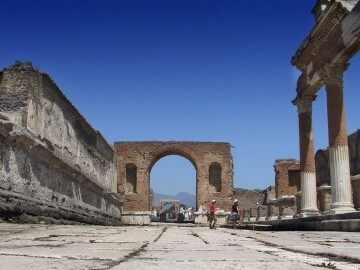 The tour starts every day from Naples, reaching Pompeii by bus in only 25 minutes. With an archeo-guide* or with a recorded audioguide you will take a path that winds its way through the most important monuments of the town. Afterward, drive up to the Mt.Vesuvius and enjoy a lunch break in a local traditional restaurant along its slopes. You’ll reach an altitude of 1000 metres (of the total height of 1100 metres of Vesuvius) to see the crater, which can be reached with a short walk. Once there, enjoy the view of the Bay of Naples.Take the opportunity to learn the geology of the volcano with a tour guide of the National Park. Discover by bus the breathtaking Amalfi Coast and discover the immortal beauty of Pompeii, the ancient Roman town buried by the eruption of the Mt Vesuvius. 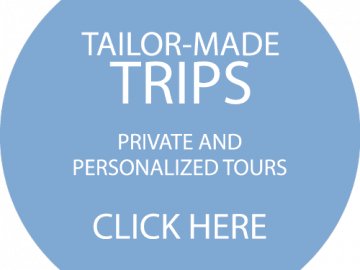 The tour starts every day from Naples city center. Along the route to reach Amalfi the bus will stop several times to let you enjoy the landscape and view of the villages built inside the cliff. 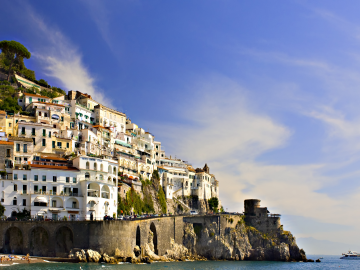 Have lunch in a sought-after restaurant overlooking the sea and visit Amalfi, the main city of the coast. 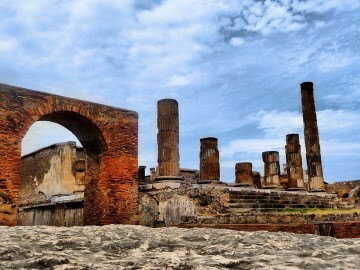 On the way back to Naples, visit the archeological excavations of Pompeii, where a guide will greet you and will start a fascinating walking tour into the history of the Roman century. 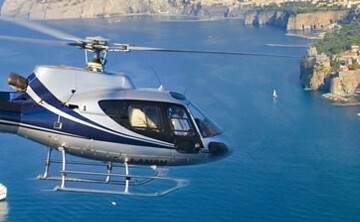 Discover Capri,one of the most famous islands in the world. You will reach the island by hydrofoil and the first stop will be in the famous “piazzetta”, the nickname of the small square Umberto I,which is one of the landmarks of the island.Walk along the narrow streets, where you can find many Italian clothing shops as well as handcrafted shops.Visit the belvedere of Augustus’ Gardens where you can have an aerial view of Mt. Solaro, via Krupp and the famous “Faraglioni”, natural landmark of Capri.After that, leave Capri and come back in Naples, where you will find a bus,which will take you to Pompeii. Here, you will take part to a walking tour inside the ruins and will explore the most interesting places of this famous archeological site. 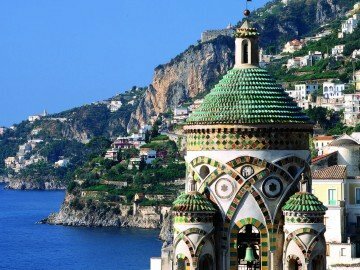 Discover Capri,one of the most famous islands in the world. You will reach the island by hydrofoil and you will have a stop in the famous “piazzetta”, the nickname of the small square Umberto I,which is one of the landmarks of the island.Walk along the narrow streets, where you can find many Italian clothing shops as well as handcrafted shops.Visit the Belvedere of Augustus’ Gardens where you can have an aerial view of Mt. Solaro, via Krupp and the famous “Faraglioni”, thr icon of Capri. 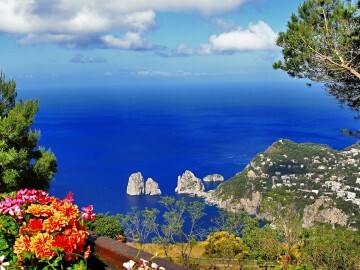 Discover Capri, one of the most famous islands in the world. You will reach the island by hydrofoil and the first stop will be in the famous “piazzetta”, the nickname of the small square Umberto I,which is one of the landmarks of the island.Walk along the narrow streets, where you can find many Italian clothing shops as well as handcrafted shops. Visit the belvedere of Augustus’ Gardens where you can have an aerial view of Mt. 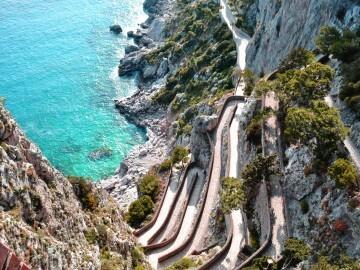 Solaro, via Krupp and the famous “Faraglioni”, natural landmark of Capri. 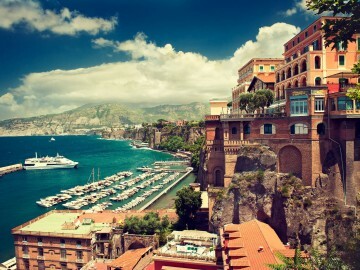 After that, leave Capri and come back in Naples, where you will find a bus,which will take you to Pompeii. Here, you will take part to a walking tour inside the ruins and will explore the most interesting places of this famous archeological site. From a distance the Vesuvius seems to be harmless but when the brave tourist approaches near its blazing crater, he sees the chasms and the power of the “big Giant”. Leaving from Naples and after a 2nd pickup in Pompeii, reach the National Park of the Mt. Vesuvius.Once there enjoy the breathtaking view of the bay of Naples and ask the guides of the National Park to be introduced to the history and the myth of this volcano and enjoy 1 hour break for lunch (not included). From a distance the Vesuvius seems to be harmless but when the brave tourist approaches near its blazing crater, he sees the chasms and the power of the “big Giant”. Leaving from Naples and after a 2nd pickup in Pompeii, reach the National Park of the Mt. Vesuvius.Once there enjoy the breathtaking view of the bay of Naples and ask the guides of the National Park to be introduced to the history and the myth of this volcano and enjoy 1 hour break for lunch (not included ).